Every young baseball player dreams of someday suiting up for his hometown team. For a Brooklyn boy, this dream took one step closer to becoming a reality. begun his professional baseball career with the New York Mets. Of all the 30 teams that could have selected him in the MLB draft, it wound up being the franchise located just 5.4 miles from his high school. The Mets chose the six-foot-three, 195-pound shortstop in the 22nd round of this year’s draft. Palmer said a few teams had been in contact with him beforehand, but he was still surprised to receive the official call from the Mets. A growth spurt after his sophomore season at Holy Cross put Palmer on the map for MLB scouts. After being named a Tablet All-Star as a junior in 2017, he enjoyed a stellar senior season for the Knights, batting .406 with 21 runs scored and 13 stolen bases. He was named to the CHSAA ‘AA’ All-League First Team and played in this year’s Mayor’s Cup Game. The 18-year-old was set to attend Long Island University Brooklyn, Downtown Brooklyn, on a baseball scholarship, but then the Mets came calling. 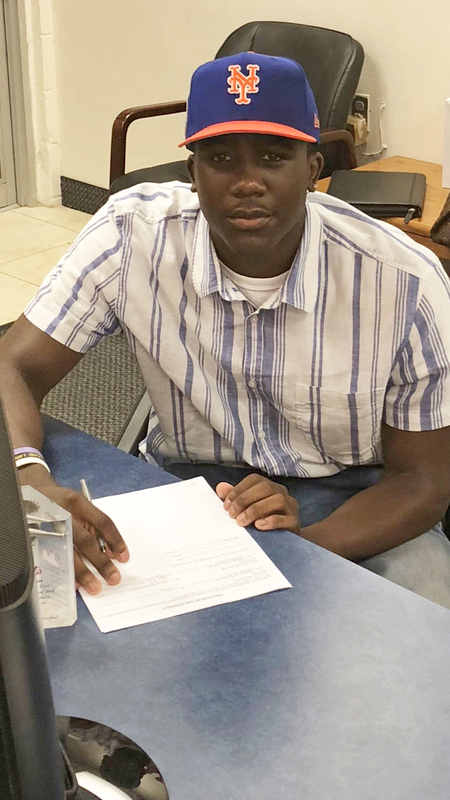 He took his time making an informed decision to sign with the Amazins’ – especially since the team will pay for his college education as part of his contract. Growing up, Palmer was both a Mets and New York Yankees fan. Some may say that’s not actually possible, but Palmer was simply a lover of the game of baseball and was lucky to have two professional teams close to him. He modeled his own game after that of the great Yankee captain Derek Jeter – definitely a solid choice of a player to emulate. Jeter was the reason Palmer wanted to play shortstop. So far, he’s been off to a hot start with the bat for the Gulf Coast Mets, the team’s rookie-level minor-league affiliate that plays in Port St. Lucie, Fla., as a member of the Gulf Coast League. Through his first 16 games playing shortstop and some third base, Palmer has hit .286 with 16 hits, six RBIs, six runs scored and two stolen bases. He said that the competition has been top-notch and that his time playing in the local CHSAA has prepared him well from the next level. The transition to professional baseball has come naturally to Palmer. He’s still adjusting to being away from home, but his work ethic from his days at Holy Cross has carried over. He wakes up each day at 5:30 a.m. and arrives at the ball field before 7 a.m. The team’s games typically start at noon, so he’s able to get in all his work – and some extra work – prior to first pitch. He developed this work ethic while at Holy Cross, and he said he’s extremely grateful for his time with Knights head varsity coach Steve Adams – specifically in helping him hone his swing. The season wraps up at the end of this month, and already it’s been a success for Palmer. In addition to performing well on the field, he has developed the maturity to handle the challenges of playing minor league ball. Through these exciting first few weeks, Palmer said he’s not trying to do too much and is instead staying true to himself, since that’s what got him to this point in the first place. He’s looking forward to continuing to grow as a player in a Mets uniform. Sounds like the current Mets could use a few Jaylen Palmers on their roster. While Holy Cross served as his home for the past four years, now it’s up to him to work as hard as possible to someday call Flushing home once again. Congrats, Jaylen. You make us all proud!